Today I can reveal that children in a Scottish primary school have learned that humans once rode on carts pulled by triceratops. 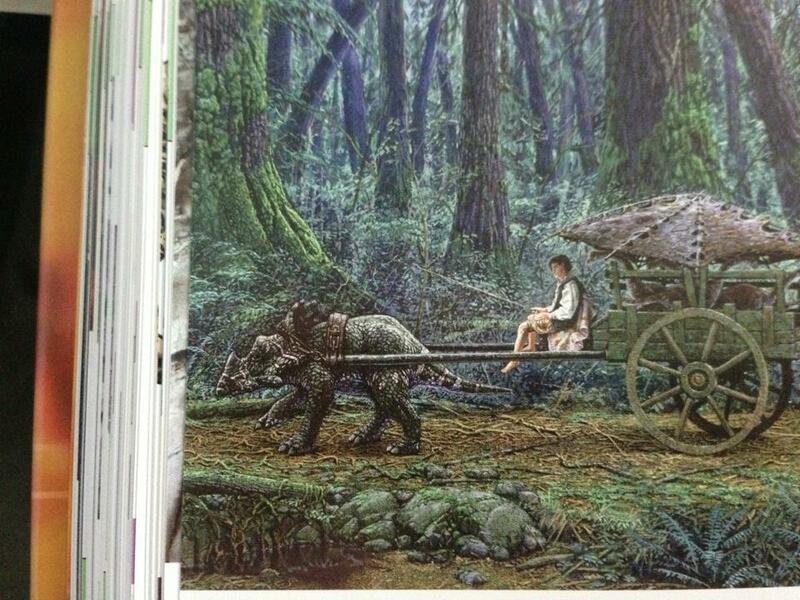 The estimable Paul Braterman, of the British Centre for Science Education, sent me these pictures which are apparently from a book handed out to pupils at the school. Parents have called for emergency talks with education chiefs, where they will demand the sect’s removal from the school. Good old Scotland. Having seen the way ACE gets covered by the local press in the USA, I’m pretty sure American media would have given this story a different slant. One angry dad, Paul Sanderson, 33, told how his five-year-old son burst into tears when he took the books away. He said: “I think it’s fair to call it brainwashing because when I took them from him he started crying. What do you do in that situation? I’d be tempted to let the child keep the book, tell him it’s just what some Christians believe, and give the child a load of good quality science books for children as well. But how on earth is a primary school meant to weigh the evidence properly? But the Record can reveal sinister undertones to their eight-year involvement at the school. The Church of Christ have targeted Kirktonholme as a “mission” and have several members helping with classes and giving lessons in religion. Church members like Blakeman – photographed as a scary Pirates of the Caribbean character – were allowed in to work as classroom assistants and help with homework and in other mainstream roles. Church leaders told their US flock in a video blog about their “work” at the school, and claimed that, out of a population of 5.1million, Scotland has only 700 practising Christians. One of the informants for my PhD recently observed that you can spot a fundamentalist whenever they refuse to accept any label other than “Christian”. They tend to reject terms like “evangelical”, and denominational ties. They’re simply “Christians” – and anyone who doesn’t believe what they believe isn’t a Christian. Hence the number of 700 Christians in Scotland – all the Catholics, Methodists, and Presbyterians don’t count. Read the rest of the article here. It’s worth it. Added together, these three numbers equal about six thousand years. 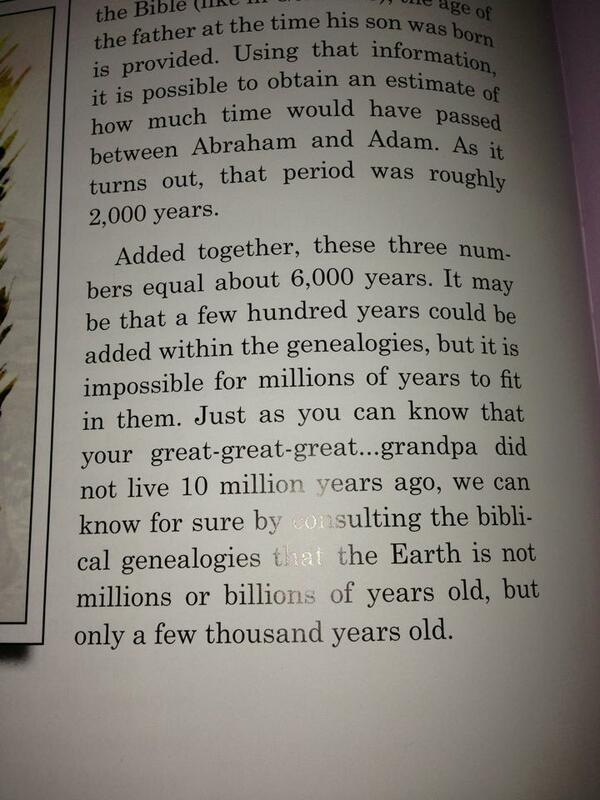 It may be that a few hundred years could be added within the geneaologies, but it is impossible for millions of years to fit in them… We can know for sure by consulting the biblical genealogies that the Earth is not millions or billions of years old, but only a few thousand years old. Now, cue the creationists claiming that we are the intolerant and closed-minded ones for not wanting their ideas to be presented alongside those of mainstream science. I think that should be the subject of a post sometime. Do any of my scientist readers want to write a guest post? UPDATE: More reporting from the Daily Record on this story. Posted on September 7, 2013, in Atheism, Christianity, Creationism, Education, Faith Schools, Fundamentalism and tagged age of the earth, British Centre for Science Education, dinosaurs, East Kilbride, Evolution, geology, Scotland. Bookmark the permalink. 34 Comments. That’s scary. I sometimes worry about that happening here in Ireland where 90% of schools have Catholic patronage. I’ve heard stories at least about religion classes dismissing what is taught in science classes to kids. I will pick a school very carefully for my son. Sandra MacKenzie, should be sacked. The money raised for the church should be confiscated and used to undo the damage done and the so called classroom assistants should be tarred , feathered , and run out of town on a pole. Or deported. Religion should be removed from schools altogether – all of them – Schools are not churches and if you want to teach your children to believe in ‘sky fairies’ then do it on your own time. Hello, I am the dad you mentioned. There was a second book that equated Atheism and Sam Harris to baby killing, life without God would get you murdered and that innocents becoming sick is due to something someone around them did wrong. That, as well as the creationst book made me decide to take them off him. Hope that clears up my reasoning. Thanks for commenting and explaining Paul. That sounds shocking. Oh, and yes, he is getting a proper Dinosaur book this weekend to replace the garbage we were given. I recently had a conversation with an evangelical relation of mine. She told me I had been fooled by evolution and that there were no facts to support it. Furthermore, she didn’t believe we had evolved from monkeys. I told her I didn’t believe that either, but I did think that the data supported the view that homo sapiens had evolved from an ancient ancestor that we shared with the modern chimpanzee. A few years ago I had had a similar conversation with her adult son who, depressingly, had adopted his mother’s dogma. I asked him which books on evolution he had read. He told me he hadn’t read any and that he started with the Bible. So, he had rejected one of the best-attested scientific theories of all time by reading a book on something else! Not just any book, but one written in the deeply superstitious, pre-scientific bronze age by unknown authors! It is easy to reject ideas if you don’t bother to try to understand them. The only answer to such wilful ignorance is education. What a disgrace it is then, when the educationists themselves substitute evidence for fantasy. Shame on them. Good to see you here, Paul. And well said. I wonder if Nimrod’s grandfather was Ken Ham, Mordecai Ham, or Jack Ham? I’ve looked at Truth be Told, one of the books handed out. It is the worst kind of creationist anti-science textbook, with chapter end quizzes (sample: briefly explain why the trilobite is evidence of Creation), claims of fossilised trilobites inside human footprints, that evolutionists are liars who try unsuccessfully to wriggle out of the Second Law, that radiometric dating depends on flawed assumptions, and other long-exploded lies. I plan to generate a full content analysis on Monday and send to interested parties. 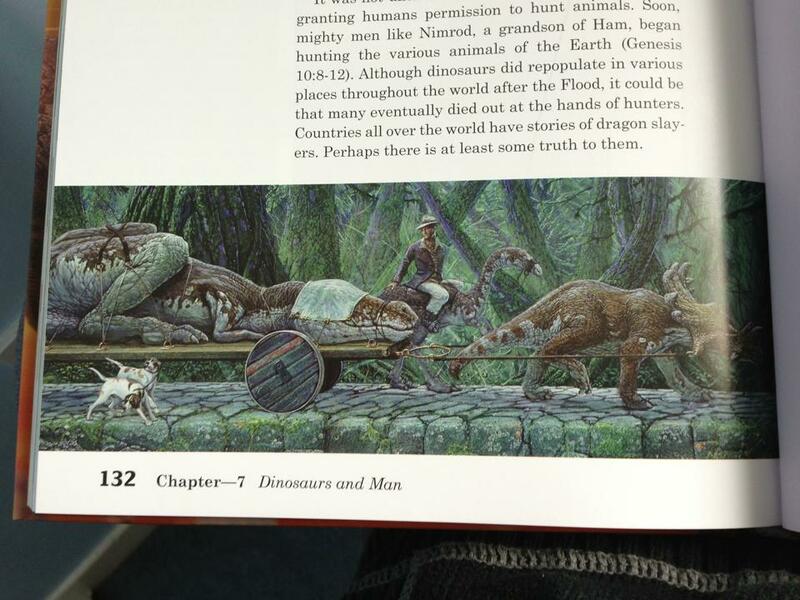 The book says that evolutionists (that would include their own science teachers at school and university) are dishonestly refusing to admit the truth, that the earth is 6,000 years old, that Noah’s flood explains the Grand Canyon, and that people used dinosaurs as beasts of burden. All this presented as real science in a textbook-like format. What got my attention is that this ‘ancient’ scenario had a man in 19th-20th century attire. And there were beagles! Did this breed of dog exist that early? This picture must have been copied from a book by H. G. Wells. Yeah, that is a point in its favour, I suppose. We saw a similar thing with the recent ACE revision of the Nessie stuff: All wild speculations, could-bes and perhapses, with nary a shred of evidence. Beagles in the Jurassic? Next step, a drawing of rabbits in the pre-Cambrian and they knock over the chess pieces and fly away crowing that they’ve won. The clothing is the biggest giveaway that the artist doesn’t believe this tripe. The reason old-timey clothes didn’t look like 19th-20th century stuff is because sewing was done entirely by hand. So you made clothes with fewer seams, to save sewing time and avoid wasting fabric (which, for most of human history, was also made laboriously by hand). It sounds like one of the numerous Mormon “Church of Christ” groups, who are generally more ‘my way or the highway’ than the point-at-mormons-and-laugh movement I grew up in. On the other hand, the article is identifying “Church of Christ” as a Southern movement, and that’s where mine started out. So I’m confused, and wondering if the reporter perhaps conflated the movements (Which is easy to do). All that said, I haven’t been to a Church of Christ service in going-on-twenty years, so it’s entirely possible I may be completely out of touch with the way things have developed. I’m guessing there are quite a lot of people calling themselves “church of Christ” after all, Christians have churches, and follow Christ. It’s about the only thing they all agree on. Churches of Christ (which happens to be my “tribe” by the way) believe in the autonomy of each congregation. So while one Church of Christ may have done this, they are not representative of all Churches of Christ, only themselves. However– most Churches of Christ are disbelievers in evolution, horrendously right-wing, and hold other fundamentalist views. But please don’t think this of all Churches of Christ. I attend a Church of Christ that is liberal, inclusive, loving, and open to evolution! Great to hear. Although I do sometimes worry about the lack of accountability in independent churches. Sounds like your bunch is a good lot, but a lot of the church abuses I read about are in independent churches where the pastor is accountable to no one. My guess, based on the information shared here, is that it this is the most conservative branch of the Restoration Movement, founded in the early 1800s, whose early leaders included Alexander Campbell and Barton Stone. Other branches are the Christian Church and the Disciples of Christ (which is considered very liberal). The Church of Christ branch is often designated as Church of Christ, non-instrumental because they are against ‘innovations’ such as musical instruments in the church. They also believe that baptism by immersion is ESSENTIAL for salvation, and most that I have met do not think anyone outside the Church of Christ is Christian. They are concentrated in Southern USA. churches of Christ are an outgrowth of the Barton\Stone movement, definitely. They’re conservative in the sense of sola scriptural, but my church had no problem with music, and we did’t believe in original sin. I went to a C of C college, but it was fairly liberal, and ere we’re classes where we were flat-out told parts of the Bible can’t be taken literally. Hi Kevin, thanks for your comment. I did not want to burden my earlier comment with undue detail, but you raise a good question for those interested in this Church of Christ. Both the Churches of Christ, non-instrumental and the related Independent Christian Churches sometimes use the names ‘Church of Christ’ and ‘Christian Church’ interchangeably, as was done before the split. This usage has caused confusion for more than 100 years. Both are continuations of the earlier Alexander-Stone Restoration Movement. Perhaps your church refers to itself as a Church of Christ but actually is part of the Independent Christian Church group. I have visited a number of both these churches and discussed theology with a number of members. However, I have not done so since the 1980s, so I did some Googling to see if things had changed. A good short article supporting my earlier statements is http://cconline.faithsite.com/content.asp?CID=39707. I also found some Church of Christ music. There is nothing more beautiful than a Church of Christ congregation singing without instruments if they sing well, and there is nothing worse than a Church of Christ congregation singing without instruments if they DON”T sing well. I think the non-instrumental singing I found here is beautiful, but you might also detect the conservative and creationist themes in the songs: http://church-of-christ.org/videos.html. Frightening. This is a severe case but to some extent this could be happening at a school near you. The local priest will have access to C of E or Catholic primary schools where there are no local alternatives. My once excellent local comprehensive is now, unfortunately, a Christian ‘faith’ academy. The local fundamentalist church now has a pastor well embedded in the staff. Only comparative religion should be taught in schools. Unfortunately in England, ex-PM Bair championed new academies; many of which are run by religious bodies. We now have ‘free schools’ introduced by, “Give every school a bible”, Education Minister Gove which means even more educational establishments are working outside the national curriculum. I don’t claim to know about UK schools, or what’s best for them. Had I my druthers, though, I’d have no problems with comparative religion classes here in the states. Alas both sides seem to oppose that. It bother sme that Evangelical kids in state schools often label anyone who believes in evolution as an ‘atheist’ when it’s simply not the case. I’d rather see religion discussed, as appropriate, in history, geography, citizenship (or whatever it’s called these days) classes and so forth, than have it be a subject in its own right. Failing that wonderful ideal though, I agree that there’s no real problem with comparative religion, subject to stringent checks against any school or teacher allowing (or purposefully making) it slide into proselytism. “It bother some that Evangelical kids in state schools often label anyone who believes in evolution as an ‘atheist’ when it’s simply not the case.” If that is the case, they are copying the likes of Ken Ham (and Bob Sorensen and Jason Petersen if you have come across them) in their online blogs and articles. If they are unsure whether or not the critic has any Christian faith, they usually assume not and label them an atheist – even if they might be an agnostic and some other kind of theist. Btw there’s a thread at the BCSE community forum, under News and Links. Reblogged this on A Pilgrims Ramblings. I’m about to start my masters in palaeoanthropology, so am only a scientist in training but if you’ll have me I’ll happily write something on creationism, science and schools. Me and answers in genesis have discussed it in the past so im familiar with the topic. I’m also planning a diablog on a related subject with a proper scientist, so might be able to rope him into it as well if you wanted. Yeah! I’d really like to read something like that! Go for it! I like the pair of domesticated dogs in the picture. So why did the Christians not just domesticate the dinosaurs instead of killing them? I bet they were tasty burgers though. Checkout the Bill Nye video bashing creationism being taught in schools. Its sad that books like the one picture exist in the world of education. I live in Scotland. It is a very diverse country, with people of many ethnicities and creeds (including atheist) calling it home. It is also predominantly liberal, championing freedom. Public secularism is the norm. Religion is private– it’s your own business. This kind of infiltration of a religious cult (I do not call it that lightly) is abhorrent and shocking. Parents are right to be outraged. This kind of evangelism is nothing short of predatory, targeting vulnerable young children who don’t yet have the cognitive equipment not to be terrified into submission to dogma. It incites aversion and hatred of others who may subscribe to a different creed, even when they’re your own friends and neighbours. If I had kids in school, and had any notion that they were being indoctrinated in this way, I would pull them out right sharpish. I don’t care if the people propagating this stuff believe they are saving souls– they need to respect the beliefs of others, or be made to sod off.